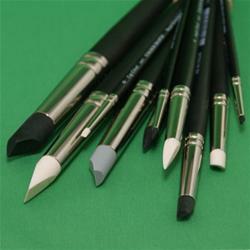 Colour Shapers are highly versatile painting tools which can be used for painting, drawing, printmaking and sculpting. With a handle like a brush, Colour Shapers have a silicone tip and are available in 5 shapes, 2 levels of firmness and 5 sizes. Both firmnesses can be used with paints, glazes, wax, plaster, pastels, and adhesives, and even to blend or smudge pastels and charcoal. Clay Shapers are designed specifically to be used with wet clay, since their tips are extra firm, but can also be used with the same mediums as Colour Shapers. Both Colour Shaper and Clay Shaper allow you to move paint easily, apply pastel, carve images in wet paint, sculpt clay, and remove paint. They can be used alongside regular brushes to create a variety of decorative effects. Because the tips do not absorb paint like a brush, they can be simply wiped clean, or dried paint can just be peeled off.